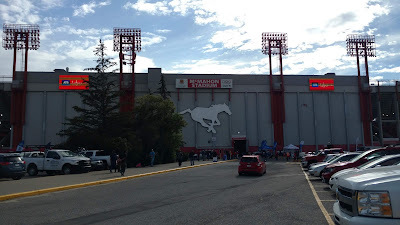 When the CFL schedule was released late last year, I immediately pegged an early-season weekend as a chance to add the three missing venues to my count, as Calgary, Edmonton, and Saskatchewan were all home on consecutive days in late June. However, as the date approached, I realized that flights between the three cities were not cheap as it was the Canada Day long weekend. So I changed the plan, flying to Calgary and driving to Edmonton, and leaving Saskatchewan for next time. 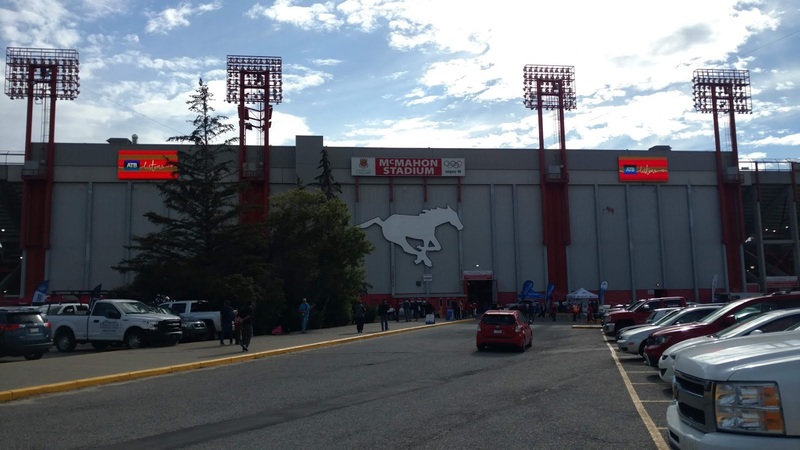 The first stop was McMahon Stadium, which has been the home of the Stampeders since 1960. 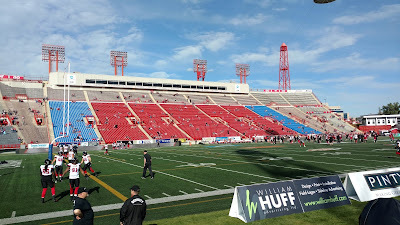 It has hosted more than just football, as it was the Olympic Stadium in 1988, and site of the NHL's Heritage Classic in 2011. Located in the northwest corner of the city, it is easily accessible from the LRT's Banff Trail station, a short ride from downtown. After disembarking, just walk over a pedestrian bridge and there you are. I was staying at a nearby hotel, so was able to walk over without the aid of public transit. 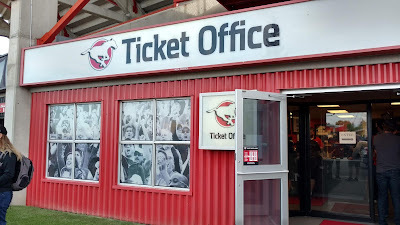 I had picked up a ticket from StubHub, so did not need to visit the ticket office, but it is located right next to the southeast gate. It is important to note directions when seeing a game at Calgary. The east side (Sections M-Z, above) is facing the setting sun, and being up north and far west, the sun sets quite late. For a 7 pm start, you can expect to be squinting until well past halftime if you forget your shades. The west side (A-L, below) is protected, but slightly cooler as a result. 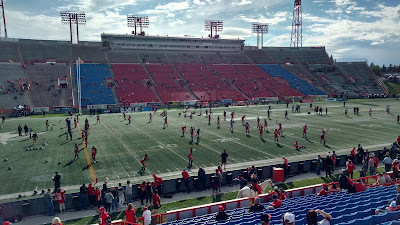 Both sides are identical, with the best seats in red, single sections of blue seats on either side, and then benches that turn in slightly as they reach the end zone. 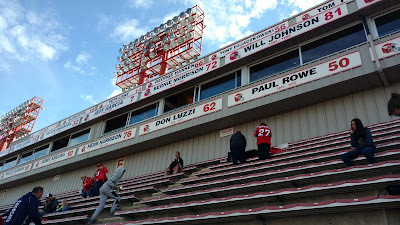 There is a walkway above row 43, and benches above that, all the way up to row 61. 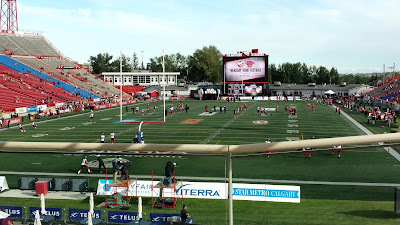 There is not much space between the stands and the field as the stadium was built for football, and sightlines are good from anywhere. 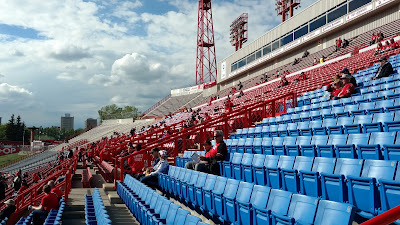 You can see the blue seats seem a bit older and are quite similar to those in Toronto's Rogers Centre. 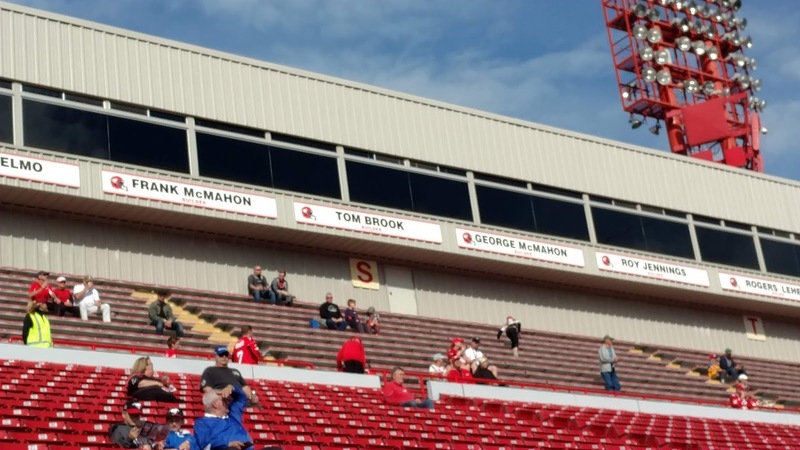 On both sides of the field, Stampeders Hall of Famers are displayed. 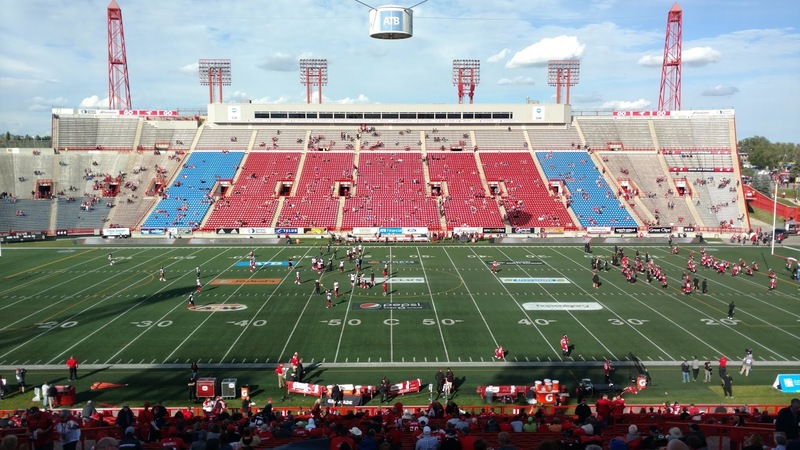 Jeff Garcia started his career here in 1994, backing up Doug Flutie, and led the team to the Grey Cup in 1998. The south end zone is where the main video board can be found, and there are no seats here. 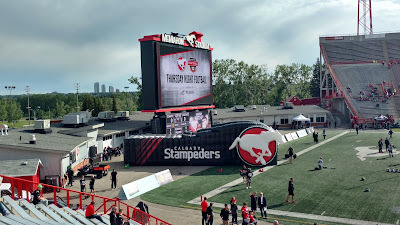 The Stampeders dressing room seems to be behind here and they run out onto the field through the tunnel you can see below. The north side is home to the Telus Patio, a private area with field-level views. Seeing how far back you are from the end zone, I can't imagine this is a good place to actually watch the game. Above this is a handicapped seating area. 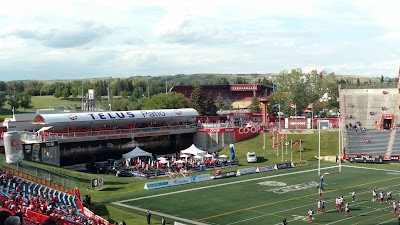 Note the ballpark in the background - this is Foothills Stadium, which used to host the Calgary Cannons until they moved to Albuquerque for the 2003 season. 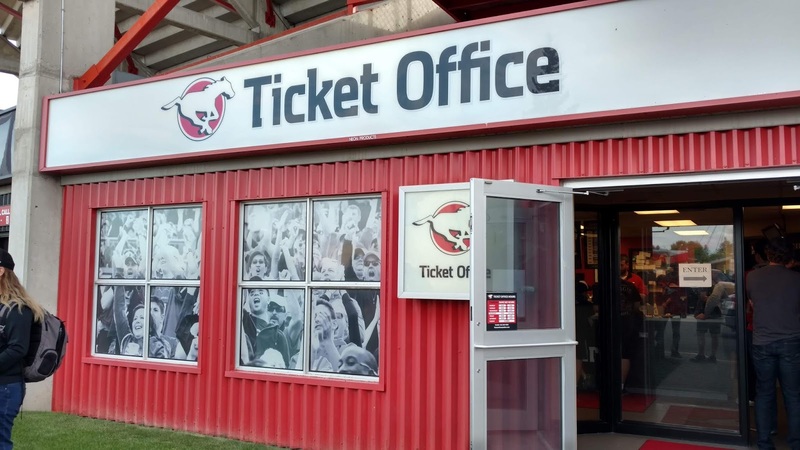 I saw a game there back in the late 1980s; long before sports road trips were even a thing. 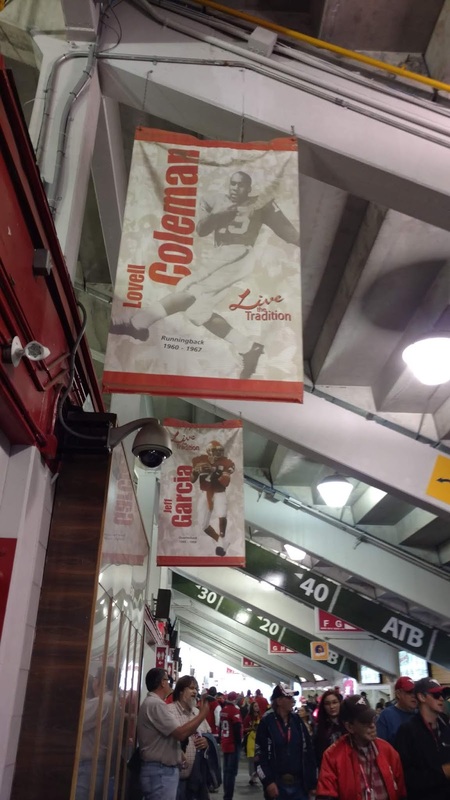 Next to the Telus Patio is a collection of pennants celebrating the Stampeders Grey Cups. 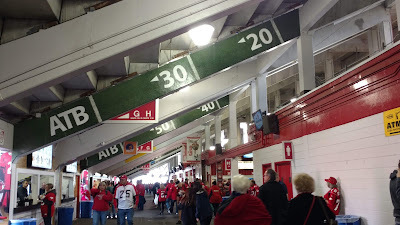 You can stand at the north end zone next to the handicapped area, though the view isn't very good, even from an elevated level. Inside, the concourses are spacious enough, with a couple of ads helping you figure out where you are in relation to the field. There are a few banners here as well, including one celebrating the aforementioned Jeff Garcia. 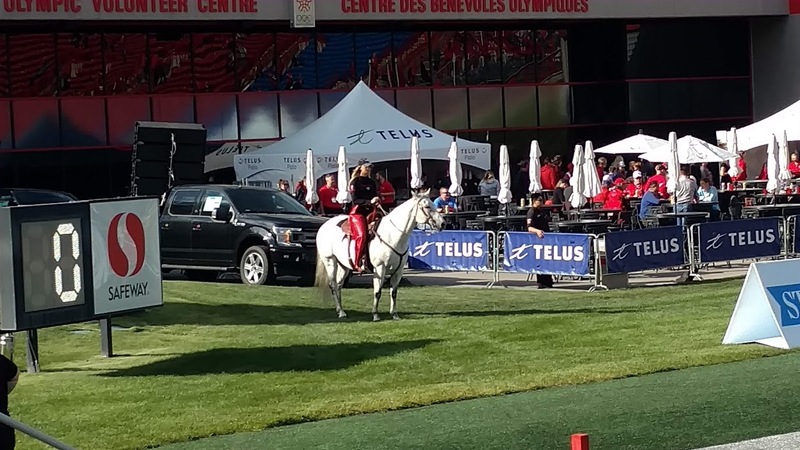 The Stampeders mascots include Quick Six, a white horse that matches the team logo and runs along the east side after a Stamps touchdown. Finally, a shot of the east stand from the top of the west. Note the speaker at the very top; this is the public address system and can be heard from quite far away, including all the way over at my hotel. 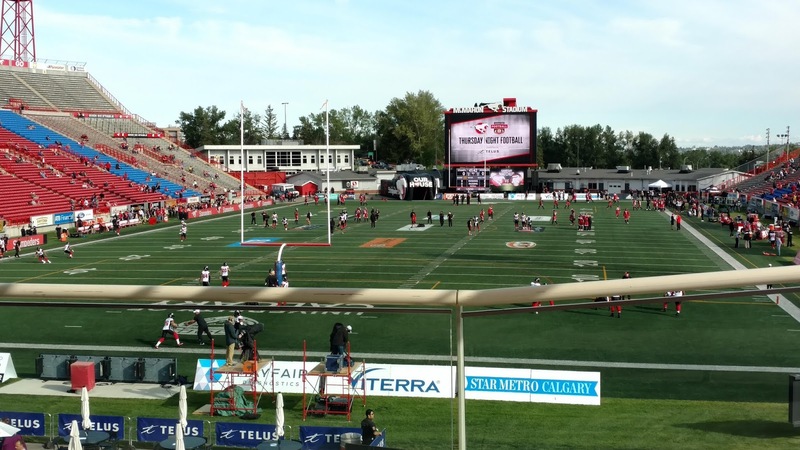 CFL facilities are much simpler than their NFL counterparts, and I enjoy them for this reason. 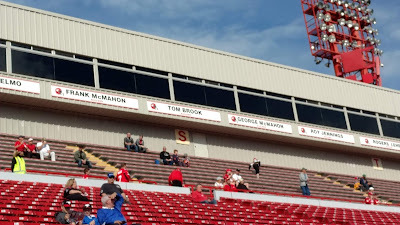 McMahon Stadium is no different and is certainly an enjoyable place to watch a football game. Fans are definitely into the game and their team, and cowbells are used frequently to celebrate any good play. 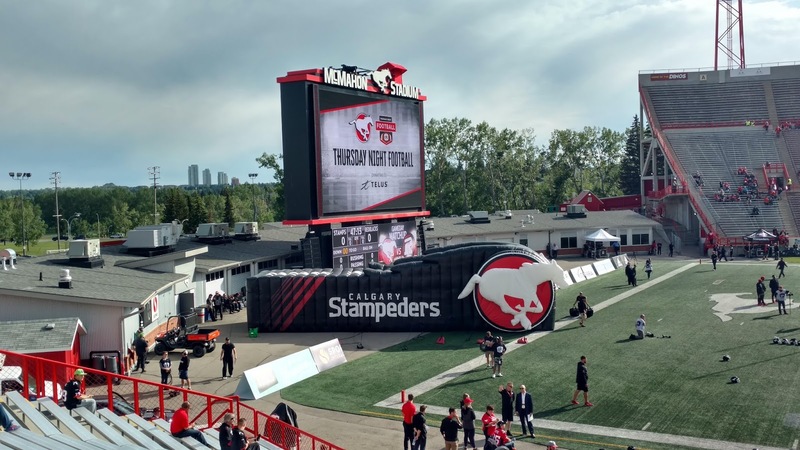 If you are heading to Alberta in the summer or fall, check out the CFL schedule and if the Stampeders are home, drop by McMahon Stadium for some old-fashioned football. Both teams came in undefeated, but that didn't mean much in Week 3, especially since Ottawa already had a bye. I picked up a seat in the second row at the goal line, a place I generally enjoy for NFL games. 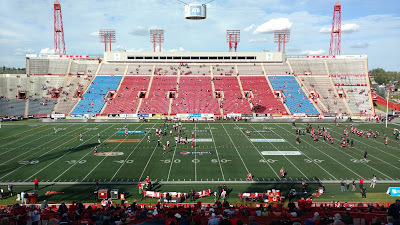 But the CFL field is much wider and action doesn't happen around the goal line as much, so I moved around for the second half. 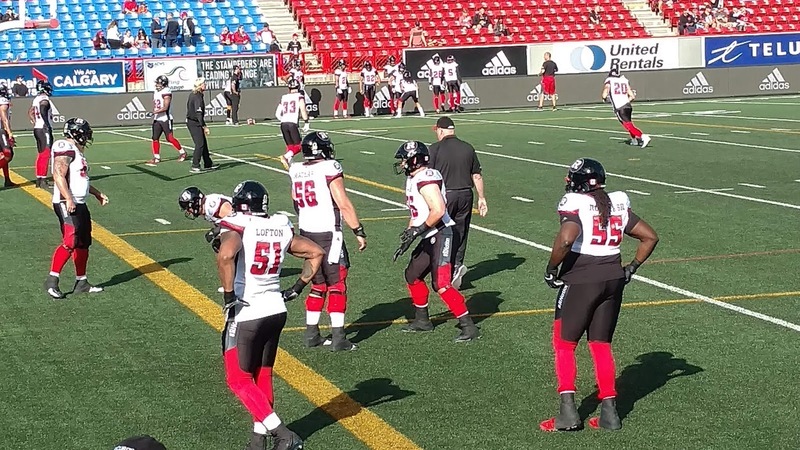 Below are the Redblacks warming up. 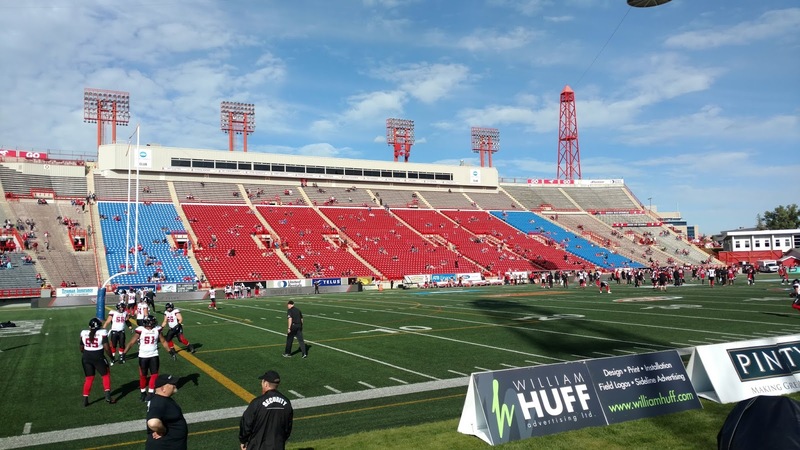 This was a defensive battle with Ottawa getting into Calgary territory a few times in the early going but unable to capitalize, leading to two field goals. 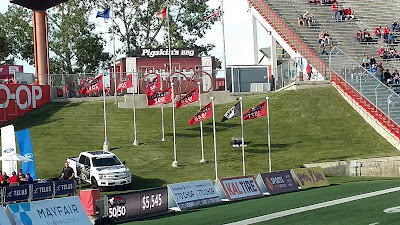 After an interception deep in Redblack territory, the Stamps managed a touchdown on a pass from Bo Levi Mitchell to Eric Rogers and halftime came with the home team up 7-6. 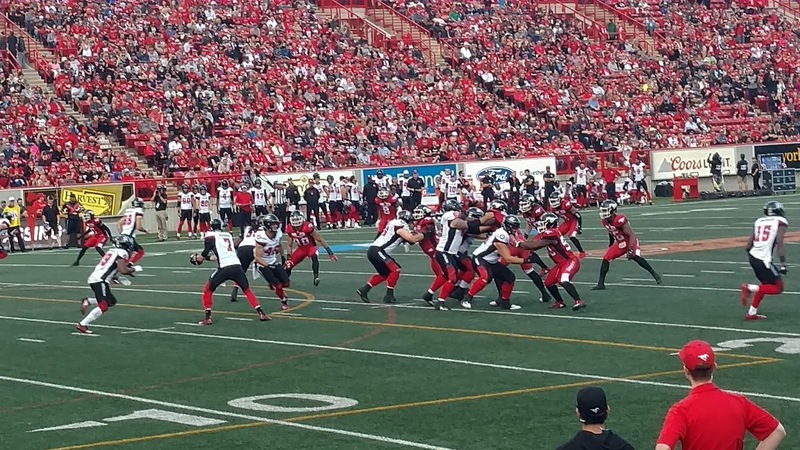 Ottawa tied it midway through the third quarter on a punt single, but the Stamps regained the lead on a field goal, with the 10-7 score holding until the final frame. 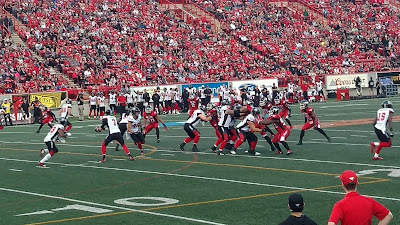 Ottawa opened the quarter with first and goal at the Calgary 4 but could not score, turning the ball over on downs. 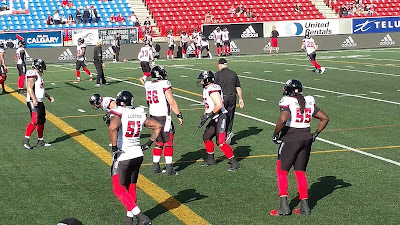 That was the turning point as Calgary moved the ball enough to get a punt safely away, and when Ottawa punted shortly thereafter, Terry Williams returned the ball to the Ottawa 37. Mitchell found Kamar Jorden a couple of plays later and it was 17-7 Calgary. 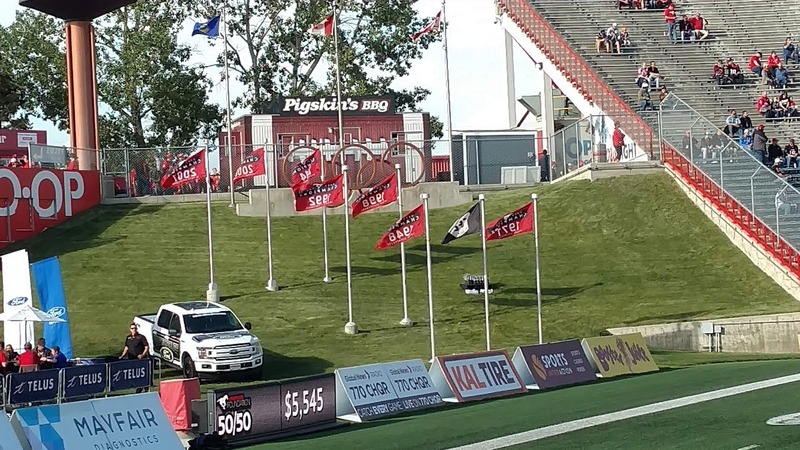 On the ensuing possession, with rain falling, Ottawa fumbled and Calgary recovered on the Redblack 23. Three plays after that, Don Jackson ran it in from 6 yards out and Calgary had pretty much clinched the game with just 6 minutes left. Ottawa did add a touchdown late to make the final 24-14 in a battle that finished in a driving rain. This was not a good game with each team punting 8 times, but that is what you can expect in the CFL, where 2-and-outs are common. Add in 7 total turnovers (including 3 on downs) and 20 penalties, and it was not a pretty affair. It also took over 3 hours, which surprised me as I thought CFL games would move more quickly than those south of the border. But there are just as many commercials to show in Canada, I guess.